Given they were teen Mod rivals, pals and frustrated wannabes in the 1960s before both quickly bypassed mere stardom for glam rock superstar deity status, the comparisons between Marc Bolan andDavid Bowie is endlessly fascinating. But there the comparisons end. While Bowie endlessly transmuted with each record, Bolan chased repetitive and diminishing returns until his fatal car crash in 1977. While Bowie killed off Ziggy Stardust and the Spiders from Mars 18 months after launching him, Bolan’s 1974 album Zinc Alloy and the Hidden Riders of Tomorrow was a bizarre gesture of solidarity, or simply a lame parody. Yet Bolan’s crowning glory is still a beauty – a slice of solid gold easy action, as a later T. Rex single put it. This needs repeating as Bolan’s reputation is one of pop frivolity, moreGary Glitter than Ziggy or Aladdin. 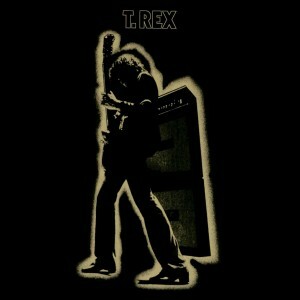 But for four years, from Tyrannosaurus Rex’s Unicorn and A Beard of Stars albums through the abbreviated name’s self-titled debut and Electric Warrior (1972’s The Slider was too patchy to continue the run), Bolan shone, with his corkscrew hair, pioneering dabs of glitter and Larry-the-Lamb-like warble. In the box set version, this re-mastered, annotated 40th anniversary edition has all the unreleased demos, out-takes and DVD footage you could crave, but the original 11 tracks are all anyone truly needs. As Bowie’s Starman put it: “Let all the children boogie.” Ziggy knew that Marc had got there first.and Stones records, and the opening Mambo Sun nails that sea change. Over a sinewy, clipped guitar riff and echoed drum beat, Bolan breathlessly announces “Beneath the be-bop moon/I wanna croon with you,” throws in his first “owwww!” and takes a bluesy brief guitar solo full of animal grace. Cosmic Dancer (later covered by Morrissey) follows, an ecstatic dream ballad with darkly contrasting cellos that single-handedly confirms Bolan’s brilliance. Then again, the song’s couplet – “What’s it like to be a loon? I liken it to a balloon” – confirmed his any-rhyme-will-do laziness that predicted his creative collapse. But in the face of Get It On and Jeepster – both outrageously hook-lined and joyous smash hit singles – and the delicate croon of Life’s a Gas, the jittery finale Rip Off and the less-acknowledged beauties Girl and Planet Queen, Bolan’s slithery swagger is irresistible.